Taking care of an oil change is a simple maintenance item that should be performed to keep your vehicle running smoothly. How often should you be changing the oil in your car? It's a question that might not have a truly clear answer, but Toyota of Scranton is here to provide the best possible one. Our Scranton, Lackawanna County, and Wilkes-Barre service technicians have years of experience when it comes to servicing and repairing vehicles. Ensure safe travels by getting your oil changed today, and check out our oil change coupons to see how you can save money on that next service. In general, if your car uses conventional oil, it should be changed every 5,000 miles. For synthetic oil, that number might be around 10,000 miles. This general guideline is useful, but there are things that should be taken into consideration when it comes to changing the oil. You may do a lot of towing, which can require more frequent oil changes as the engine is working harder. Many of your travels may be done on the highway with few stops in between, which means oil might last longer. The owner's manual is there to be your friend. The maintenance section of the owner's manual will provide plenty of information, but is particularly useful for oil change information. These days, many vehicles feature an oil monitoring system, which can take a lot of the guesswork out of this process. These systems have sensors in the drivetrain which track engine movements, temperature, and drive time. The data will predict when the oil needs to be changed, and the maintenance light will turn on with plenty of time to have your car service. These systems can detect when driving conditions may change. Stop-and-go driving on city streets or heavy traffic may mean an oil change is performed earlier, while highway drivers might be able to drive longer between oil changes. This can get you out of the mindset of "every 5,000 miles" if you're looking for more accurate information. You might not love the idea of homework, but at least you aren't in school anymore. This homework is important, though! You can do some things at home to take care of your vehicle. If your car has a dipstick, take it out, wipe it off with a cloth or rag, then put it back in. Take another look at the dipstick to ensure the oil is smooth and amber in color. If the oil is dark or thick, that usually means it's time to have it changed. Loud engine noises are another sign the oil needs changing. Schedule an oil change near me today. 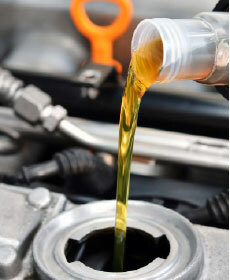 An oil change is a must-do when it comes to engine maintenance. At Toyota of Scranton, our service technicians work on the cars of Scranton, Lackawanna County, and Wilkes-Barre drivers, performing those always-important oil changes. Schedule your next trip to our service center, and we'll handle the rest.